About a dozen cars, several of which had been carrying methanol, have overturned in a train derailment north of Valley Mills, TX. People in the surrounding area have been evacuated by a hazmat team which is dealing with the chemical leak at the scene. Five of the derailed cars were carrying methanol, Department of Public Safety spokesman Trooper D.L. Wilson said, reported AP. Two of the methanol-hauling tanks have started leaking. No injuries were reported as a result of the incident but as a precaution, Wilson confirmed, ten homes in the area were evacuated. Bosque County Emergency Management are still on the major train derailment about a mile north of the Valley Mills city limits after multiple train cars overturned and started leaking chemicals. “VMVFD unit and multiple agency are work a MAJOR HAZMAT EMERGENCY just north of the city limits,” the city’s fire department said on its Facebook page. 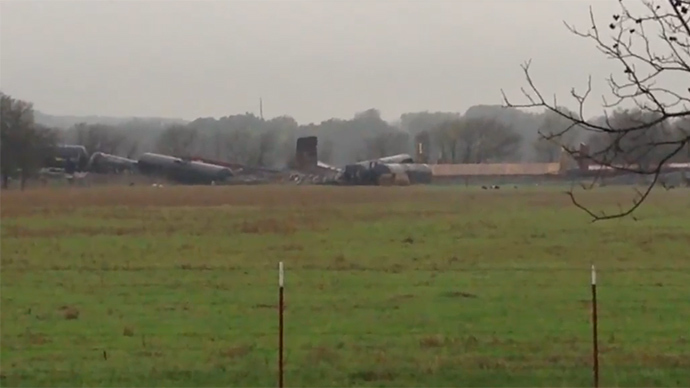 CBS Texas reports that seven of the derailed cars were flatbeds carrying drill pipes in addition to the five tankers containing methanol. Overall the train was made up of 40 cars. Post by Albert Curtis Rodriguez. Hazmat teams are monitoring air and water conditions at the scene, saying their biggest concern is the environment, now that everyone downwind have been evacuated, reported Kristianna Gross of News Channel 25 in Waco. The cause of the derailment remains unclear at present, but heavy rainfall in the area may have been a factor. The fire department urged residents to stay clear of State Highway 6 and FM 217.